Okay...so here goes...my first post. I figured I'd learn as I go and go ahead and get this party started. Please stay tuned as I add photos and posts in the coming days. Way to go, Karen! I so happy you decided to take the leap. Looks great so far! 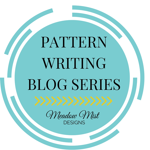 Blogging is such a part of my quilty life. I am still learning after 7 years! Can't wait to see what you have to share with us Karen! I'm also Joining you on the 2015 New Blogger's Blog Hop. Welcome. Congrats on starting your blog! It will be an amazing adventure! I'm visiting from the New Blogger's Hop. I blog over at quilitngmod.com. Best wishes in your new adventure of quilt blogging. Hi, Karen! Meeting you tonight was such a pleasure. I hope to see a new post up soon! Look forward to hearing from you. Nice to meet you on your blog! Love your pincushion! Hi Lesley...it was great to meet you at the sew-in last week! Hope to see more of you! Awesome, Karen! Best of luck in your new venture! I know you will succeed in whatever you do!!! Hugs!!!! My 5 W's WHO: Besides being a wife, mother and grandma, quilting brings me to my happy place. I'm a flight attendant by day, which gives me the means to play with my creative quilty side. WHAT: Manipulating fabric to create different fonts makes me giddy. In college, studying graphic design, I always said I'd specialize in lettering. Little did I know it would be with fabric and not the printed page. WHEN: I started sewing when I was ten years old, almost half a century ago. I saved up all my money and bought my first sewing machine before my eleventh birthday. I guess I've been creating ever since. WHERE: We raised our family in Nova Scotia. Although our childrens' jobs have taken them all over Canada, my husband and I remain in this beautiful province on the east coast of Canada. WHY: I can't imagine being passionate about another craft and the women I've met during this journey makes it all worth while!